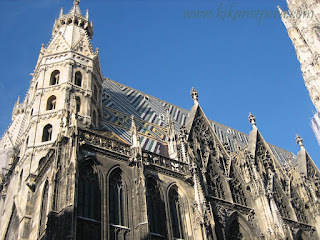 It is not surprising that the Stephansdom (St. Stephen's Cathedral) is called the Heart and Soul of Vienna for it has survived many wars and has become a symbol of Vienna's freedom. For over 800 years, from a small Romanesque church to the grand Gothic Cathedral that it is today, it has seen many additions, been burned down and destroyed by war, and was reopened in it's present glory in 1948. 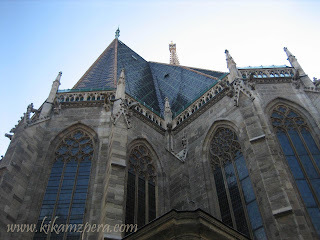 One cannot miss the magnificent diamond-patterned glazed-tile roof that the Viennese citizens generously donated in 1950 nor the Gothic edifice of dark stone and the north tower called the Alter Steffl, "Old Steve" that rises to 450 feet. The Interior contains lots of interesting works of art too, from the Gothic to the Renaissance style. 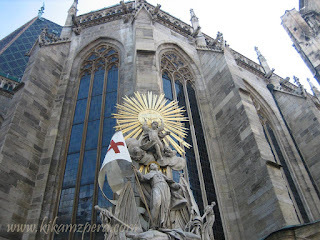 The intricately sculpted pulpit, figures of saints adorning the piers and the canopies over many of the side altars are just some of the Gothic masterpieces. 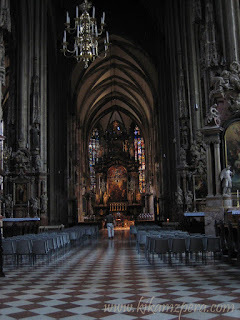 The Wiener Neustädter Altar bearing the painted images of 72 saints is the cathedral's greatest treasure. 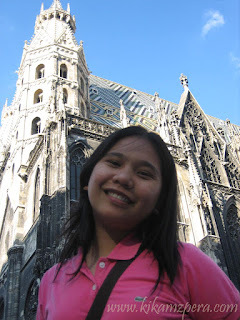 My digital camera's features and zooming capacity though cannot do justice to the beauty of the cathedral's interiors and I only have this lone photo above which I consider to be the best. Hehe! I really wished then that I had a DSLR to capture what my eyes can only see!